A topic that comes up a fair bit when helping people get in shape is what do you do in your free time? The answer to this can have a big influence on your health and fitness. For most people it is usually one or more of relax, catch up with family and friends or do a hobby if they have one. The reason getting in shape is so hard is that it is woven into the fabric of your life. So for any change in your body you will usually need an adjustment to your lifestyle. While the internet may say you can simply follow a magical workout 2-3 times a week the real world of results says it has to be more than that. You have to eat less somehow and / or move more to change shape. The ease to which you can do this brings us back to the question of what do you do in your spare time? Do you relax by watching TV or going for a workout? Do you catch up with your friends in the pub or by going for a walk? Do you spend time with the kids by putting on a DVD or taking them down the park? Do you de-stress with a glass of wine or 15 minute meditative routine? What hobbies do you have a hobby that makes you active? The different ways to spend your time can have a huge effect as the result is usually sitting down eating and drinking vs moving around. That can be a real big swing in either direction depending which way you decide to spend your time. This weekend I was back in Wales, I met my friend for a dog walk. Only problem is both of our dogs have died within the last year. But fear not, we didn’t resort to standard meet for a meal. 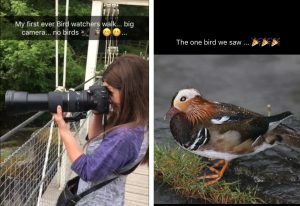 Instead, she has taken up photography and we went on a great walk trying to photograph some birds of North Wales. That is a active hobby and an active way to catch up friends. As it was, we got soaking wet and she only took one photo of a bird. However, it was fun none the less. Photo Below – The Mandarin Duck in Llangollen. Study after study has shown you will only move if you find it enjoyable.